Jesus took generosity so seriously, that he made it his way of life. He did not apologize for being generous and humble. He came as a humble servant, and in his life, we have the ultimate in giving. For Jesus there was no holding back, no reserve, and no condition. His generosity for us was without condition. WE have the opportunity to return that love by financially supporting the ministries of OUR church -- St. John Lutheran Church. As people of God, we give because God has given so much to us. We give to make an impact locally in the Cedar Valley, across the country, as well as globally through our mission efforts. Giving Envelope: Cash or a check may be tucked into a numbered giving envelope. Envelope sets are mailed directly to your home on a bi-monthly basis for your use. Text Giving: text your donation amount to 217-636-5370. Mobile Giving: Give by swiping your credit card at the Welcome Center. Appreciated Stock: Stocks, qualified charitable donations and other securities are a welcome gift. At the same time that you contact your financial advisor, please contact the church Operations Manager, Kathy Duke. Provide the name of the stock or mutual fund, the number of shares, and your intentions for your gift. Online Giving: It’s easy to transfer a one-time gift or to make recurring offerings from your bank account, directly to St. John Lutheran Church. With St. John's secure giving system, in partnership with Vanco Services, you incur no fees when you give online. You can set this up yourself or contact the church office for assistance. 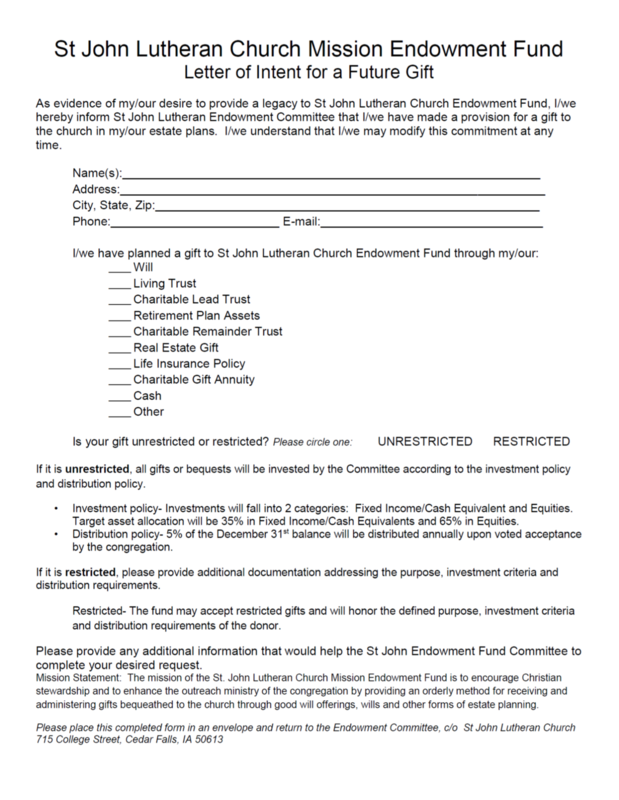 The mission of the St. John Lutheran Church Mission Endowment Fund is to encourage Christian stewardship and to enhance the outreach ministry of the congregation by providing an orderly method for receiving and administering gifts bequeathed to the church through goodwill offerings, wills and other forms of estate planning. Share your intentions with family. Tell your family about the St. John Endowment Fund so that they are aware of your wishes. Speak with a Professional. Work with a financial planner, CPA, or attorney from St. John that understands the opportunities that the St. John Endowment Fund provides and is able to help you document your intentions. Review and update Beneficiaries. Consider adding the St. John Endowment Fund as a beneficiary on your life insurance policies, retirement accounts, or other investment accounts as a way to provide a lasting gift that will impact the lives of others. Small contributions make a difference. The Endowment Fund accepts gifts of all sizes. All gifts are greatly appreciated and, when added together, help to provide blessings to others in meaningful ways. Immediate gifts are gladly accepted in the weekly offering. Please note "The St. John Mission Endowment Fund" on your check or offering envelope. Seek the advice of your financial or legal advisor. Planned gifts must have proper documentation to ensure the wishes of the investor are carried out. Fill out the intent letter found here. Where does $ from the fund go?